Time now to have a look at lunches. Most of us work outside the home, and either make our lunch, or buy something quick when the time comes. And most of the time, what is easy, portable and available is grain based, usually bread – sandwiches, paninis, bagels, pizza, hamburgers, kebabs. But how healthy are these choices? Bread has been called the staff of life, and it forms a staple part of many people’s diet. But humans have been eating grains for less than 20,000 years (a mere blip in evolutionary history), and we haven’t all adapted to them yet. One good thing about grains is that they are a cheap, filling source of calories, and in the past (and for some people still today), when food or money was scarce that was very important. They also affect the brain in the same way as narcotic drugs, which is why they make you feel so good after eating them, and why they are popular. But they are not a good source of nutrients, and if they are not prepared properly can be downright dangerous to your long-term health. In our Western society, food is plentiful, and our rising obesity rate is due to high calorie, low nutrient foods such as soft drinks, processed foods full of sugar and refined fats, and yes, bread products. And it’s not just a weight problem. Many people have health problems from eating wheat and other grains, sometimes unknowingly. But wheat is so pervasive in our society that’s it’s very hard to avoid. 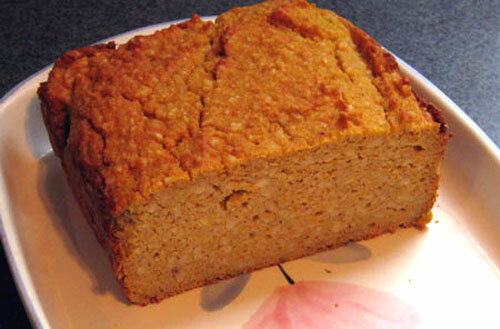 And grains are the ultimate comfort food, so breads are very hard for many people to give up. In this lesson, we’re going to look at some bread alternatives which are healthier. They have most of the anti-nutrients neutralised, and use a minimum of refined ingredients. There are a range of options, so even if you usually avoid grains totally, don’t turn to the next lesson just yet – there’s something here for you as well. But let’s not kid ourselves, these recipes are for ease and convenience, when the kids nag for pizza, and for when you just feel the need of a little comfort. Others can’t take gluten in any form, but can enjoy breads made from non-gluten flours such as buckwheat, quinoa, amaranth, rice or corn (still prepared correctly). Quinoa is especially good as it is not a true grain and is comparatively high in protein. But it needs to be thoroughly rinsed before grinding, so if you want to use it, it’s best to grind it yourself. Some people don’t tolerate large amounts of starch in any form, and should avoid breads and grains as much as possible. But for an occasional treat, we have a pizza base and some cheese “scones” made from ground nuts and seeds. If you get really keen and want to try a “real” Traditional sour dough bread, try either Garrick or Tom’s recipe at the above link. Whole grain Pancakes, with gluten free option. If you want to experiment further with gluten free baking, there are gluten free recipes in the baking section, plus more information in the appendices. AVOID all margarines and spreads, including Olive oil based spreads. But if you like the olive flavour, you can make your own by beating some butter till it’s soft and creamy, then adding a little olive oil and beating some more. When you refrigerate it, it becomes a spreadable butter. Start with just a small amount of oil, and experiment to find the consistency and flavour you like.